In our technological age, we can work from almost anywhere. 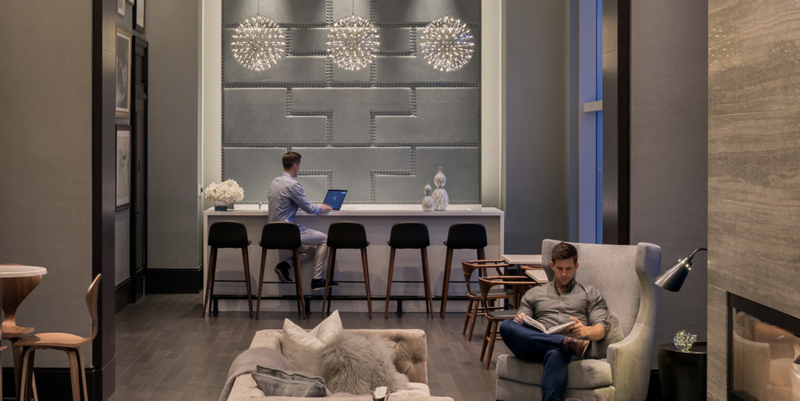 When your home is at 555TEN’s Hudson Yards apartments, where the standards of luxury and convenience are as high and far-reaching as the views, you may find it harder and harder to leave for work in the morning. Luckily, with 555TEN’s amenities, building-wide Wi-Fi, and work-friendly environment, you can make that desire a reality. You may, in fact, find that the expansive outdoor and live-work spaces in the building, in addition to your masterfully appointed apartment, will give you not only greater ease, but an increase in inspiration and productivity. At 555TEN, you can set up a home office where the parameters lie well beyond your own apartment. On chillier days, you can get cozy with your laptop in front of the fire in the 56th floor bar/lounge and work while taking in the views through the floor-to-ceiling windows. In the summer, you can take a conference call from a poolside chaise lounge. The rooftop means you can work alfresco whenever you want to feel the breeze or catch the sunset as you transition smoothly from work to play right where you are. With so many options, it’s easy to combat the ever-dreaded health risks of being stuck at your desk all day. At the 555TEN luxury rentals, you can transform a work break into a relaxing dip in the pool—getting to the water is a matter of feet instead of blocks or miles. Or, make it a workout break—take advantage of 555TEN’s Health and Wellness floor where you can get your cardio fix, do a high-intensity interval workout on a Peloton stationary bike, let off any work-related steam with the Nexersys Boxing Exergame, or take a yoga class. With a studio that’s also open to you to use on your own, you can develop your personal yoga practice, tailor-made to work with your needs and work schedule. Working in and around 555TEN also means you don’t have to feel isolated by the convenience of working from home. The 555TEN community will always be there to help you feel more connected to other people “IRL.” But when privacy is what you crave as you work from home, or is something you need for especially important projects, your apartment just may be the perfect home office space. With double-paned windows to offer you the peaceful views of the city without the noise, and with interior designer Paris Forino’s serene color and texture combinations as a backdrop, work will start to feel like a seamless part of luxury New York living.